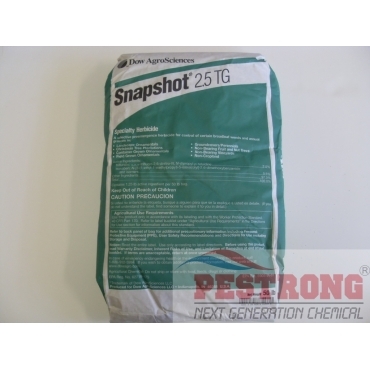 Where to Buy Snapshot 2.5 TG Herbicid, Snapshot 2.5 TG Specialty Herbicide - 50 Lbs - $102.95 for Sale with Fast Free Shipping! Snapshot 2.5 TG Specialty Herbicide - 50 Lbs provides up to eight months of control for 115 broadleaf and grassy weeds in 413 field-grown and 235 container-grown ornamentals without harming them. • It offers long residual. Depending on factors such as weeds controlled and application rate, Snapshot specialty herbicide provides up to eight months of control. • It saves time and money. It saves landscape and nursery professionals thousands of dollars in handweeding labor costs. Good herbicide, good price, free shipping. Effective product. I use this all the time. Snapshot works amazingly well! I would recommend this product! Got to love the free shipping! and Great service as well. Heard many good things about this product. Can't wait to get it delivered and I can try it out. I come back every year to purchase Snapshot and it works amazingly well. I've had very good results with snapshot and would recommend this! Im happy with how much ground this covered. I like the size as well. Being smaller particles, it will desolve quicker and therefore work faster. I cant really tell you how it worked yet. Just purchase this product and our monsoon season is a couple months away. I've used sprays before and they take hours to put down and this takes minutes. No neck ache with this product. Snapshot or Treflan does an excellent job keeping the weeds down in shrub beds. I have had very good results with snapshot or treflan. I would recommend either one. Also both got some advantages in certain situations to using these because they can be used in a spread application for difficult to reach areas. Your rep just called before I even finished email about double order . THAT IS INCREDIBLE CUSTOMER SERVICE!!! THANK YOU!